Delta is testing a facial recognition machine that will allow passengers to self-check their luggage. Delta is testing a face-scanning kiosk for baggage check. The machine allows passengers to bypass check-in agents. It uses facial recognition technology to match your identity to your passport photo. You tag your own bags, pay the fee and drop your luggage on a conveyor belt. Passengers without passports can still check their own bags, but they need a Delta agent to confirm their identities. Delta will test four of the machines at Minneapolis-St. Paul International Airport this summer. The airline spent $600,000 on the four kiosks. 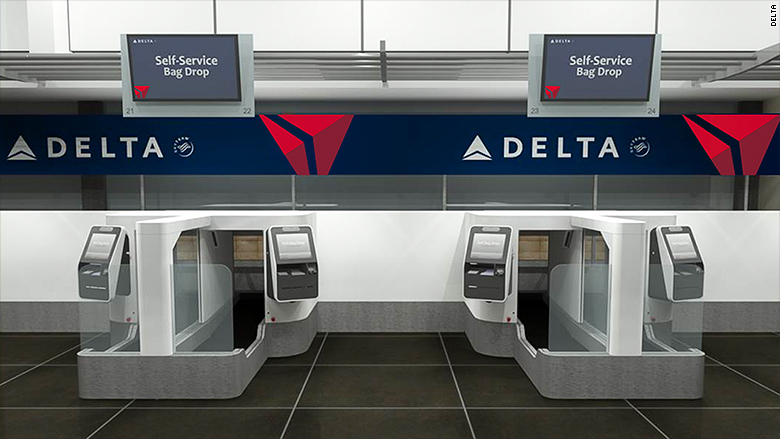 Delta (DAL) said the kiosks could allow the airline to move twice as many passengers per hour through check-in. Gareth Joyce, the airline's senior vice president of airport customer service and cargo, said the machines will free agents "to seek out travelers and deliver more proactive and thoughtful customer service." This summer is expected to be busy for air travel, fueled by the recovering economy and low air fares. Long security lines have already been reported around the country. Delta says the scanned images will not be stored and the system complies with privacy laws. JetBlue (JBLU) and Southwest (LUV) have optional self-service for bag check-in, but an agent still has to check your ID.